We interviewed members of the Chardon Middle School Power of the Pen team and will be sharing their responses throughout the summer. Next up, Melody W.
Melody W.: I decided to join Power of the Pen because ever since I was in fourth grade I have loved writing. When my sixth grade English Language Arts teacher, Mrs. Culliton, told me about Power of the Pen there was no question about it: I had to join. MW: My favorite part of the writing process is probably coming up with ideas for the places and characters in my stories. . . Wait a second. . . Is that even a part of the writing process? Never mind. That’s not actually a part of the writing process. Well in that case, I like the part of writing where you get to write. MW: Even though I love writing, my least favorite part of the writing process would have to be starting a story. However, that isn’t a part of the writing process either, so it has to be editing. I hate editing my writing, and only really like writing it. MW: I think writing is important for many reasons, but one of the biggest reasons is because writing is a way to express yourself without having to actually talk to anyone. It’s a way to put your feelings into words, and your imagination on paper. MW: Some of my favorite writers are Kate O’ Hearn and J.K. Rowling. I like their books because they take the normal world we live in and create a whole new world inside of it. They make the world a more interesting place. MW: I think that libraries are amazing places where people can go to get away from the rest of the world. They have a book for everyone, no matter how much you don’t like reading. They’re also great places to hang out with your friends or find research for a school project. MW: There are many books that I would recommend, but if I had to choose one it would be the Pegasus series. I have read the whole series three or four times through, and it never gets old. 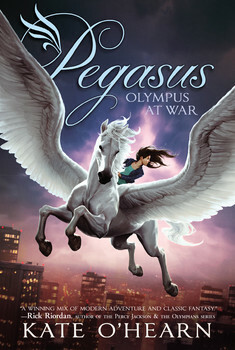 So far, Pegasus still stands as my favorite book. Melody is entering 8th grade at Chardon Middle School. You can read her Power of the Pen stories in our Young Writers of Geauga County collection.